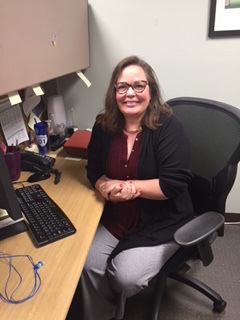 She has worked as a Case Manager at DSC for over six years now, and is one of many Direct Service Professionals (DSPs) on staff. There is national recognition for DSPs this week and we are joining in the celebration! Lori has a lot of history working with individuals with disabilities, as she was a Special Education teacher in southern Illinois and Carrie Busey before working at DSC. Her husband Joe also works at DSC! Lori and Joe live in Urbana with their son Dan. Their older daughter Melody attends the music program at Millikin University. The whole family loves music, and they spend a lot of time traveling to listen to live music. They used to play Markets at the Square! Lori also loves to sew, knit and crochet. Lori recently earned an award for DSP Recognition Week…”Fourth and Long Award”, for being the “Most Likely to Come Through in the Clutch”! We are so thrilled that Lori is part of the team at DSC! If you’d like to be part of the staff here, please take a look at http://www.dsc-illinois.org/employment2.html. Be sure to share with any talented, dedicated people you know!